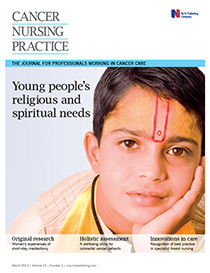 Aim To identify the spiritual and religious needs of young people with cancer, and to explore some implications of these for enhancing patient care. Method Semi-structured interviews were conducted with nine young people aged between 11 and 16, as well as seven of their parents. Eight oncology staff participated in two focus groups. The first explored their understanding of the spiritual and religious needs of patients, the second tested initial findings. Data were analysed thematically by a multidisciplinary academic team. Findings Spiritual needs were classified under personal issues, relationships and attitude, and environment. Religious needs were identified as hope, resilience, ritual, connection, use of language and world view. Conclusion Young people’s spiritual and religious needs should be assessed on an ongoing basis, with staff being supported to undertake such assessment through the use of relevant tools, activities and a discussion of appropriate language. Identification of strategies, time and staff availability to help young people process difficult emotions may be beneficial. Gestures of kindness can make a difference to patients’ wellbeing and their feelings of connectedness, hope and resilience. Developing a community and culture setting is also important. A positive physical environment can contribute to young people’s self-esteem, feeling valued, comfort and building a community.